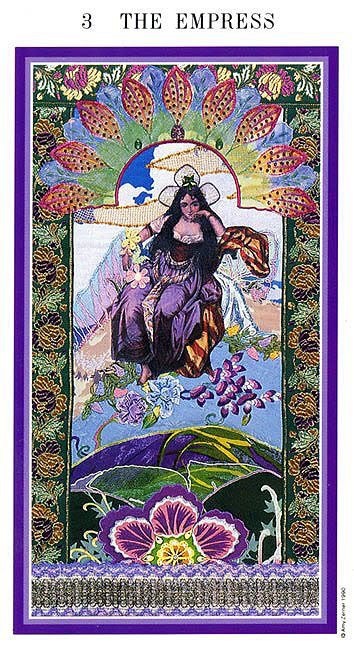 Card: 3 The Empress – from The Enchanted Tarot by Amy Zerner and Monte Farber. 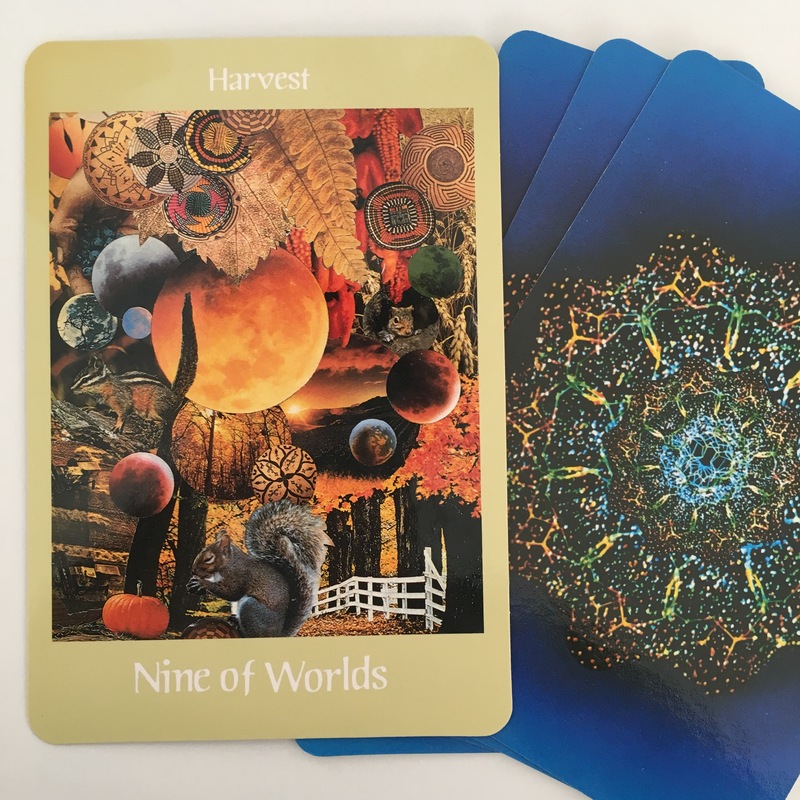 Message from the Faeries: This week we are expanding upon the message from last week. We talked a bit about reality and the creation of reality. The Empress has shown up to teach you something else about the nature of the world you live in. The Empress is in full control of her surroundings. She has fully mastered the creation of her own reality. She lives in a world that is full of beauty and love. Her world is just and fair. Her world is fully balanced and harmonious. She worked really hard to make this reality. She did so by being diligent and not allowing anything into her surroundings that didn’t line up to her vision of how the world ought to be. The Empress realized that there were many illusions, belief systems, ideologies and people that didn’t share some of her core values. She saw that there were many distractions and obstacles put in place to block her from living in the world that she wanted to live in. She discovered that in order to live how she wanted to live, she would have to build her own kingdom. Her kingdom only allows in people that share her vision of how the world was meant to be. We don’t expect you to master the art of creating your own kingdom, and we don’t even expect you to have the skills to create your own reality, but we have aspirations for you. We hope that you challenge yourself at this time (now more than ever!) to learn how to bend and shape your reality to how you want it to be. This doesn’t require magic or any special gifts or talents. It really is quite simple to do. -if you are in an environment that isn’t what you like or feel comfortable, change it or leave. If you think these aren’t options, you might want to consider changing how you think or feel about your environment. -if the news is getting you down, stop watching it. It doesn’t make you a more ignorant person or a less informed person if you don’t watch the news. Most of what is shown on the news are distractions and half-truths. If you really want to know about something, do your own investigations and research. -if you aren’t liking the energies in your space, create your own energies through smudging, dancing, singing, meditation, communicating peacefully, etc. -if you don’t like any of the current belief systems, you can choose to have none or you can make your own. You can do whatever you want in this regard. Your spirit and your intellect are yours to shape however you want to shape. -if you don’t like your thoughts or feelings, change them! -if you don’t feel like your friends or family are supporting you or being kind enough to you, make new ones! BUT – ask yourself first – are you being a good friend or family member? If any of these suggestions seem too complicated for you or out of reach, we have some more simple suggestions: only listen to music that makes you feel good; only watch tv that makes you feel enlightened or inspired; be creative and make something; make a new friend; go for walks in nature; write a book; change your diet; read a book that teaches you something new; get some exercise. 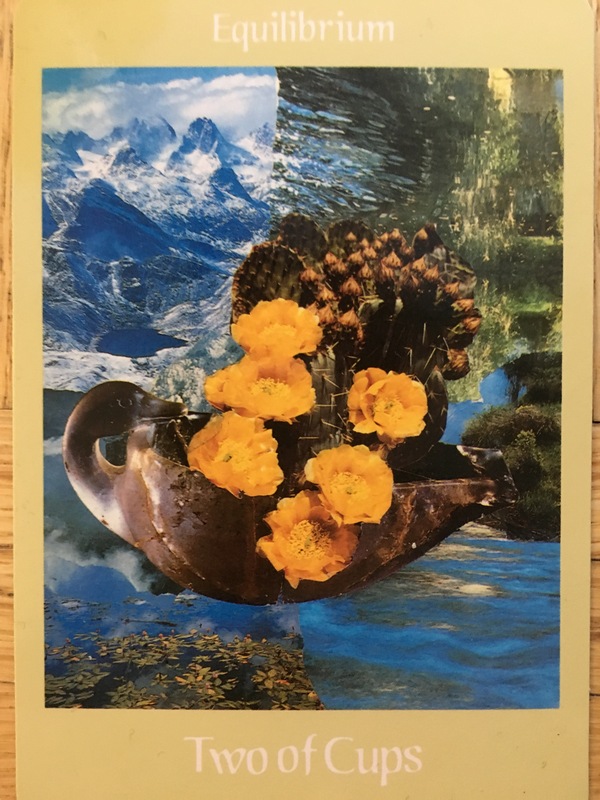 Card: Two of Cups – from the Voyager Tarot by James Wanless Ph.D. Message from the Faeries: How are feeling these days? We sense a lot of anxiety and anger and fear from a lot of you these days. Whatever it is that you are feeling, there is no judgement from us. These are turbulent times and it’s easy to get emotionally and mentally caught up in the crashing waves. This week, we want to remind you once again that it is important that you try not to get to carried away with these strong emotions you are experiencing. Meditation is a really great tool to help you stay afloat and keep your head above the water. Take the time to sit and be quiet. Take lots of deep breathes and watch your emotion and thoughts. Feel your feelings and think your thoughts but there is no need to hold on to them and dwell on them. Let go and move on. Do this as much as you need to. We warned you previously that some not so nice things were coming down the line, globally, and we don’t see this trend ending any time soon. We aren’t trying to be doom and gloom, we are just keeping things real. Here is the thing to keep in mind: things are always constantly moving and changing. Sometimes these changes are perceived as good and sometimes they perceived as bad. From our perspective changes and shifting is always happening and it is neither good nor bad. While you may not have control over events that happen globally, or even what happens to you personally, you do have a choice in how you carry yourself. You have the ability to change and modify your perception. You have the will to not become a slave to your emotions. It’s okay to feel afraid of something, but staying in that fear is to your detriment. Being accepting of the changes that are happening is one way to not get caught up in the waves of chaos. We aren’t talking about giving up, and we aren’t talking about giving in. What we mean is: be the observer. Watch things unfold and step outside of it. Accept that you can’t change what has happened, and then come to a resolve. What are you going to do to make things work for you? What are you going to do to ease your anxiety? What are you going to do to make changes you need to happen? But don’t sit there and wallow in the depths of despair. This isn’t going to help you or anyone else. Tranform this energy of despair and let it propel you to greatness. 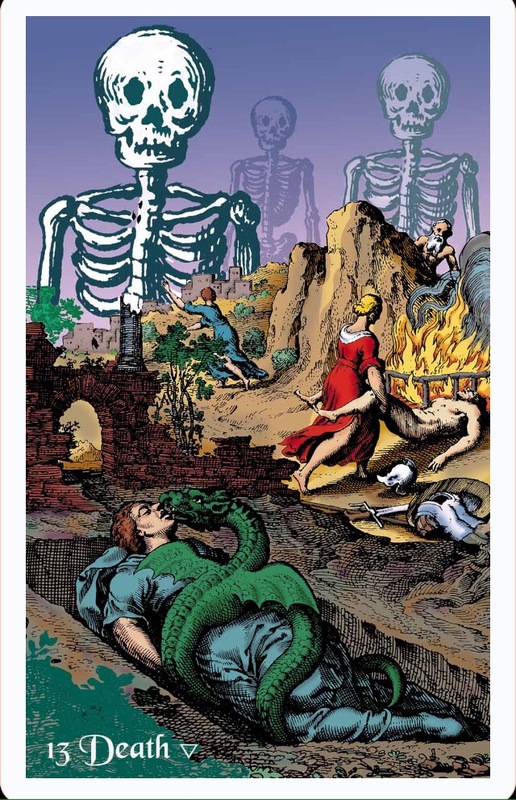 If you would like a tarot reading Erin, you can order one here. 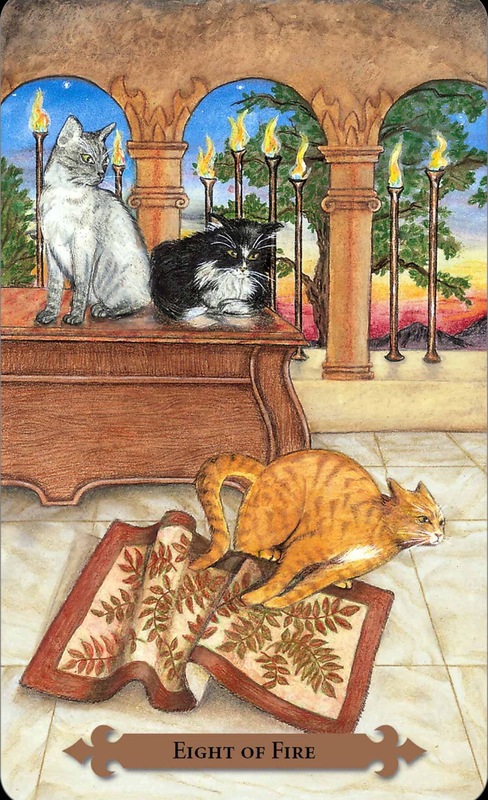 Card: Eight of Fire – from the Mystical Cats Tarot by Lunaea Weatherstone. Message from the Faeries: This week you may find that you have a sudden burst of energy and a wave of inspiration. Perhaps you’ve been feeling low in energy, or maybe you have had no desire to work on fun projects. With the New Moon that has passed on Sunday, and the energy from the Thinning of the Veils this week, a new energy has arrived. Take advantage of this burst of energy and make the most of it. Let it charge up your energy reserves and get your juices flowing. If you have been thinking about taking up exercise or taking up a healthier lifestyle, this week is the perfect week to do so as you will have enough will power and determination to get yourself started on a new pattern of behaviour. Also, if you’ve been in a situation that hasn’t been feeling good or you are in a relationship/friendship that is very unhealthy and you’ve been looking for a way out, then this card is the sign you’ve been looking for that it’s time for you to leave. Have courage and do the right thing. You deserve only the best. If you would like to have a personal reading done by Erin, you can order one here. Card: Six of Winter – from the Fairy Tarot Cards by Doreen Virtue and Radleigh Valentine. Message from the Faeries: Despite some of the uncertainties and chaos in the world, there always room for positivity and hope. This week will hopefully restore some of your hope. There is always light to be found, even in the darkest of moments. There has been a shift this week and things might start to feel easier and less heavy. There is lots of room for grace right now. Open your hearts to allow things to happen with ease and grace. There is no need for struggle. Now is the perfect time to do all your unloading. It’s time to let go of things that are weighing you down so that you can move on to the next phase of your life. 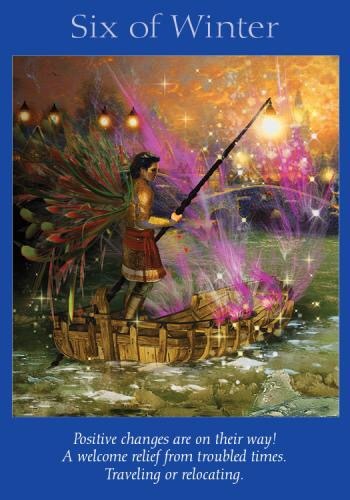 It might feel difficult sometimes to move on or go forward from events, places or people, but the energy that is occurring right now will assist you in letting go. It really is quite remarkable how easy it can be. It’s really important to keep moving forward with your life plans and goals right now. The momentum is about to really pick up in the next few months, so you don’t really want anything holding you back or weighing you down. If we were to change the art on this card, it would be of a faerie on a surfboard waiting calmly for the next wave. Metaphorically speaking, right now you should be waxing your surfboard because that big wave that you’ve been dreaming of is about to come your way. Get ready for an amazing ride! 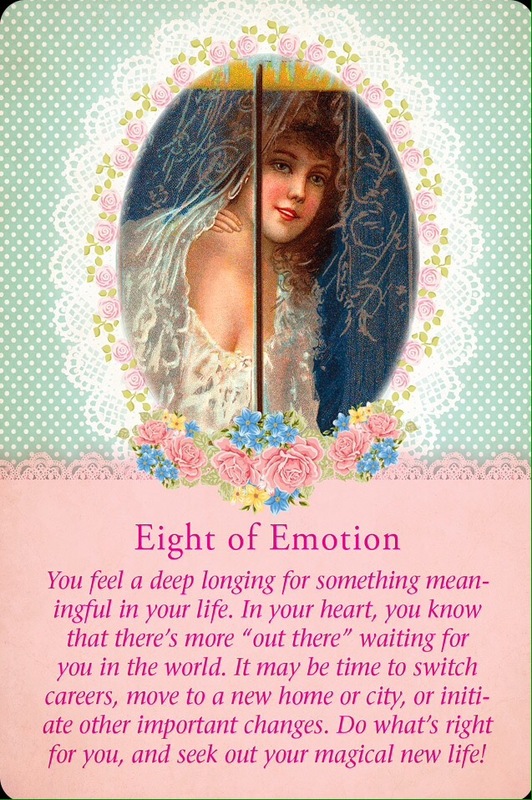 Card: Eight of Emotion – from the Guardian Angel Tarot by Doreen Virtue and Radleigh Valentine. Message from the Faeries: Some of you may have felt some huge shift in energy, this past week. There is definitely a wave of huge changes happening on the planet right now. Some of these changes might seem a bit scary, and some of them might be exciting. Regardless, change is unavoidable right now. This is a a great opportunity for you to really focus on the kinds of changes you want, or need, to make for yourself right now. Take charge and be the captain of your life-ship. Where are you going? What do you want to be doing right now? What direction have you steered your life-ship? When you are the captain, as opposed to a passenger that is just along for the ride, you get to be in charge. As the captain, you get to decide where you are going and what kind of adventure you want to be on. Be in charge and take action to make your dreams and hopes come true. The best life-ship captains are the ones who are able to sense which direction the winds of change are blowing, and they know when to let go of trying to control things and just let the wind or waves take them to where they need to take them. They trust and know that they are safe in their life-ship as long as they respect and abide to winds of change. They don’t resist change, they go with the flow. So get out your maps and compasses, and all hands on deck. It’s time for a new adventure! 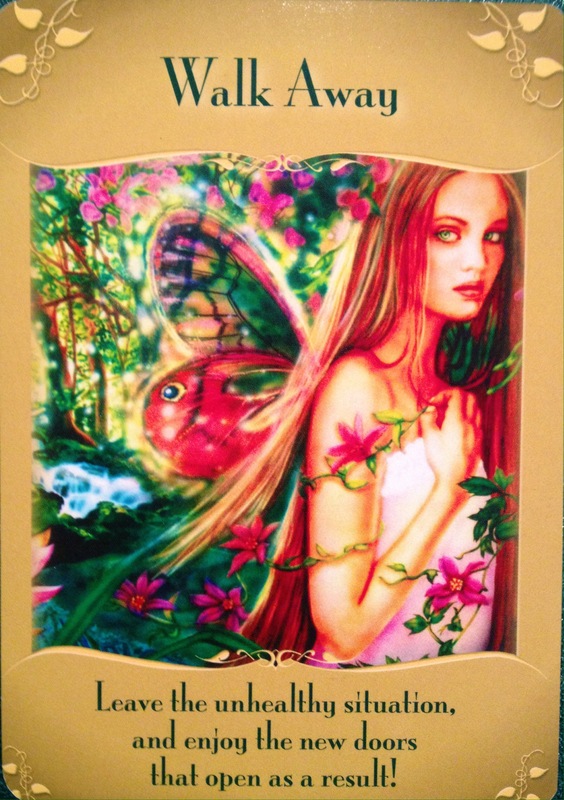 Card: Walk Away – from Magical Messages from the Fairies by Doreen Virtue. Messages from the Faeries: Walking away is hard to do. It takes a lot of courage and strength to walk away. This is one of the reasons why this week is the perfect week to walk away, or at least start steps to move on. What is it that you’ve been want to walk away from? Are you unhappy with your job? Are you ready to leave a relationship? Are you wanting to live somewhere new? Whatever situation you’ve wanting to leave, now is a good time to start seriously thinking about it and putting things into action. You may not necessarily feel like it, but you have the strength and power to make the change. Change can be difficult, but this change you are trying to do for yourself is such a healthy choice, that while it may be a bit scary or painful at first, it’s the best possible thing you can do for yourself. What is really important for you to know is that you don’t have to go through this alone. You can always ask for help. You can ask your friends and family for the support you need. Depending not on the situation, there might be an organization or agency that can help. Maybe you need to hire a professional. Regardless, it’s always okay to ask for help. If you feel you have no one to turn to, we are always here for you no matter what. You just have to ask us, and we’ll be there for you to assist. This is a good time to pray and ask for help. You may be surprised at how things can unfold with ease and grace.